OILOVITE provides an economical supply of vitamins, minerals, trace elements and amino acids needed in every physiological pathway, including bone and tissue growth and repair. 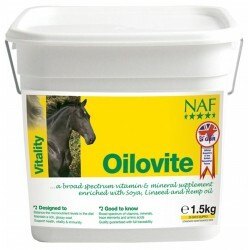 The formula contains all the essential amino acids which the horse cannot synthesise himself and which are required for protein absorption and muscle health. A blend of soya, linseed and hemp oil is included to naturally support condition and shine.